Meet the Teenage Mutant Ninja Turtles, the most irreverent reptiles in the universe! 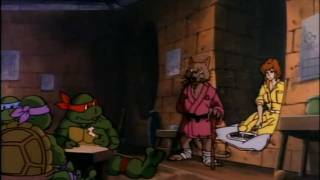 These are the first classic animated episodes that tell the origination of Leonardo, Michaelangelo, Raphael, and Donatello. Once tiny pet store turtles, an accident hurtles them into the city sewer where mutant goo transforms them into something else! Fighting for good against the malevolent Shredder and his Technodrome, these pizza-eating dare-devils are a funny, phenomenal foursome.